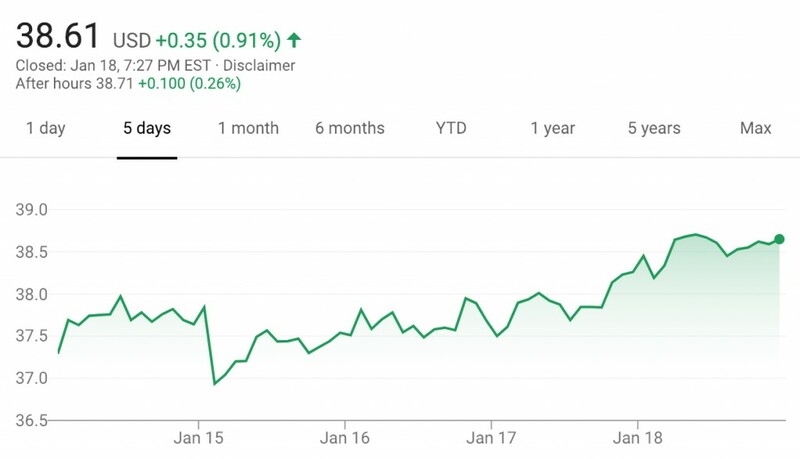 The value of GM stock grew 3.6 percent or $1.36 during the January 14th, 2019 – January 19th, 2019 timeframe, closing the week at $38.61 per share. The gains experienced by the week mark the second consecutive week that GM stock has seen an increase in value. This week, the boost came on the heels of the Detroit Auto Show, where GM unveiled the Cadillac XT6 crossover SUV and pre-announced an electric Cadillac crossover. We also believe that the investors conference held by GM last Friday, during which the automaker outlined several future Cadillac vehicles and how they will contribute to the bottom line, also played a notable role in the ongoing rally for its stock. Despite these notable moves, the value of GM stock has remained close to the $33 per share value of the “New GM’s” Initial Public Offering (IPO) in November 2010 on the NYSE, a circumstance that has had many an investor frustrated. However, the rally experienced during the past two weeks is a very positive turn of events. Rather see a return to monthly sales reports than now-weekly stock updates. Well the GM Full Sized Vans have gained an increase in sales recently, that’s some good news that I can accept based on everything else that’s taking place right now.